The State University of Nizhni Novgorod (UNN) was founded in 1916. Today UNN is one of the leading classic universities in Russia. In 2009 in accordance with the results of the competition by the resolution of the Government of the Russian Federation UNN acquired the “National Research University” category. UNN is ranked 74 by the QS World University Ranking BRICS, and has five ‘QS Stars for Excellence in Teaching, Employability, Innovation, and Facilities. UNN is one of only 15 Russian universities awarded in 2013 with a prestigious grant of the Government of the Russian Federation to implement the Leading Universities International Competitiveness Enhancement Programme. The University provides higher education to approximately 30000 students, including 1000 PhD students. UNN provides fundamental education in compliance with the best Russian higher school traditions. The combination of high quality of education and its availability at UNN due to a wide range of study programmes and forms of training is the hallmark of the University in the context of global knowledge economy. UNN realizes over 250 specialist, bachelor and master’s programmes (both full-time and part-time). UNN also offers Bachelor’s programmes “Information Technologies”, “International Relations”, “Economics” and Master's programmes "Mathematics and Computer Science", "Management", which are taught in English. The University of Nizhni Novgorod (UNN) is an internationally recognised higher education institution: UNN is a member of the European University Association (EUA), it is represented in the Deans’ European Academic Network (DEAN), it has contract relations with more than ninety foreign educational and scientific centres. UNN is actively involved in cooperation with foreign partners, it has won many international awards and works in close connection with various Russian and foreign companies (Intel, Microsoft, NVIDIA, Cisco Systems, Sberbank). UNN graduates may gain a European supplement to the Diploma of Higher Education, which follows the standards established by the European Commission, Council of Europe and UNESCO/CEPES. 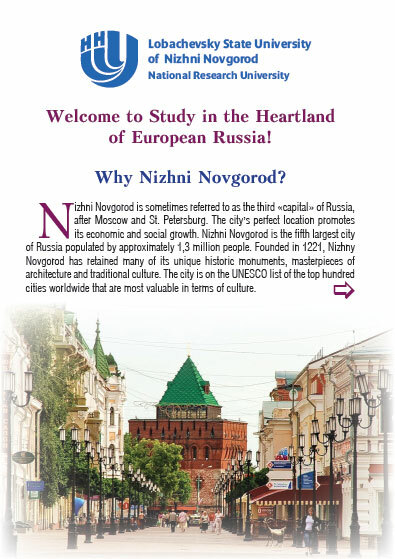 For further information on the University of Nizhni Novgorod see the official UNN website.